Address: 2531 West Cliff Dr. 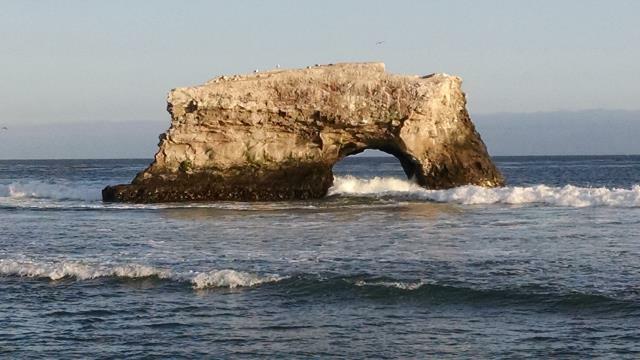 Looking over Natural Bridges State Beach towards the lone remaining arch. This oasis on the edge of Santa Cruz packs a number of amenities in a relatively compact 65 acres. Despite its diminutive size, it plays a large role in the migration of Monarch Butterflies along the California Coast. It's the largest over-winter site in the state and from October through February large numbers gather here clinging to the trees and each other. Humans too seem to be drawn to National Bridges. The sandy beach on the Pacific Coast is a draw for families on sunny days. From the beach one is afforded views of the naturally occurring rock arch just off shore that gives the park its name. Why Natural Bridges and not something singular in reference? Not too long ago the formation you see here was actually comprised of 3 arches in a row perforating the cliff jutting into the ocean. The weathering of wind and water that formed the arches continues unabated. In the early 20th century the outer arch collapsed. The inner arch fell in an 1980 storm. The state beach's boundaries contain a number of different sub-units denoting different protection levels for the animals that live or visit here. This includes both the Moore Creek Wetlands Natural Preserve and the Monarch Butterfly Natural Preserve. Even with those protected areas one can conjure up a hiking or walking loop by combining the Moore Creek and Monarch Trails. 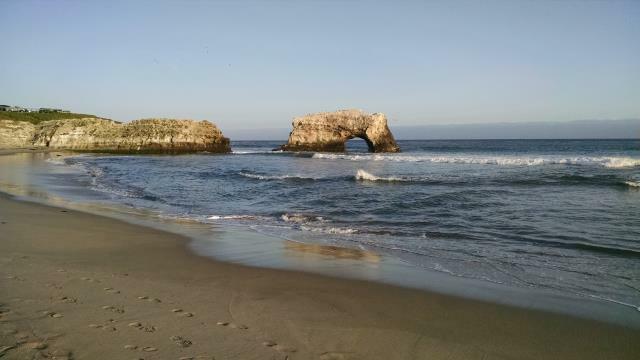 Though there might be but a mile of trail within the confines of the state beach itself, there's a bit more distance to be found via the shore along the Natural Bridges State Marine Reserve. The rocky terrace overlooking the ocean hosts a number of tidal pools and leads west all of the way to the Seymour Marine Discovery Center, if not a bit longer. Coppertone and I dropped by this park after having eaten in town and did a quick stroll along the shore as the sun was setting. After taking a picture of the arch from the sandy beach (of course!) we walked along the rocky shelf of land just above the Pacific. In a couple of places we walked just to the edge of the water spray as the waves crashed into the rock. We could have spent quite a bit more time just looking at the waves and birds in the water. Of particular interest to us were the ducks bobbing on the water, each of which would dive under water just before a large wave approached.